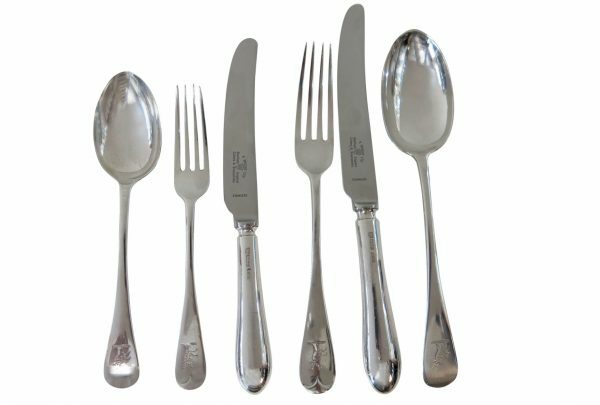 German, “800” silver flatware set for 12 people, in a deco style, hand-hammered, Bauhaus influenced design. Made In Berlin, circa 1920s By H.J. Wilm. All with hand engraved “R” monogram. The set consists of the following items 12 table spoons,12 table knives, 12 table forks, 12 dessert spoons, 12 dessert or salad knives, 12 dessert or salad forks, 12 bouillon or compote spoons, 12 fish knives, 12 fish forks, 12 lobster forks, 12 hors d’oeuvre or appetizer forks, 12 cake or pastry forks, 11 ice cream spoons, 12 tea spoons, 11 coffee spoons, plus 26 various serving pieces. Total of 204 pieces. A very large & comprehensive flatware set, complete for 18 people with a selection of 14 serving pieces. Retailed by Antal Bachruch, Budapest, Circa 1920’s. Bachruch was an important silver & jewelry retailer at the turn of the 19th/20th century. The set has 10 place setting per person, as shown in the pictures, and is complete for 18 people. Set Consists Of 18 Of Each Of The Following: Table Knives (Stainless Blades) 25.5cm (10 1/8″), Table Forks 22cm (8.75″), Table Spoons 22cm (8.75″), Fish Knives 21.5cm (8.5″), Fish Forks 18.75cm (7.5″), Salad / Dessert Forks 19cm (7.5″), Cheese / Dessert Knives (Stainless Blades) 21.25cm (8.35″), Ice Cream Spoons 14.25cm (5.65″), Tea Spoons 15.25cm (6″), Coffee / Demi Tasse Spoons 11.25cm (4.35″). 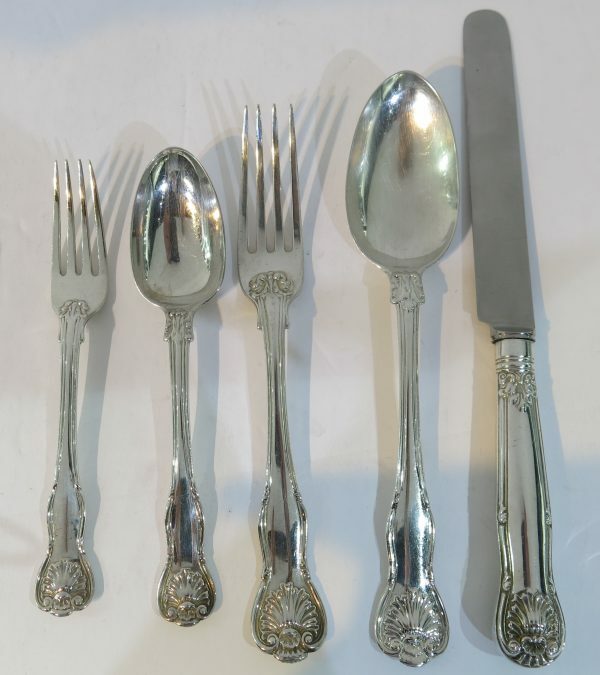 A stunning, antique French, silver plated, flatware set complete for 12 people, 20 pieces per place setting. Also included in the set are over 50 serving pieces, all fitted in the original 10 drawer cabinet. Cabinet measures 20.5″ x 16″ x 23″ high.